A cable connector is an odd thing to get excited about, but when it’s something as ubiquitous as USB you can perhaps forgive people for getting a little worked up. The new Type-C connector has been making some appearances at the International CES this week, and it brings several improvements that are worth paying attention to if you’re a USB user, which most people will be for some time yet, at least until everything goes wireless. 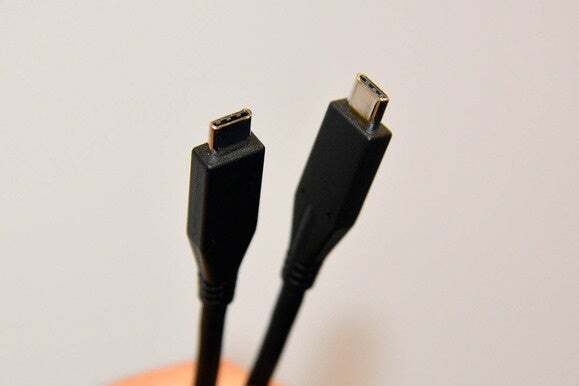 Having handled a Type-C connector here I can tell you that it felt very sturdy, so despite being as slender as a Micro USB connector it doesn’t seem like we’ll have a ”bendgate” over USB Type-C.
One of the chief benefits is that the connector is reversible, so you won’t have to worry any more about plugging it in upside down. Also, both ends of a Type-C cable can be identical, so there’s no small end for your phone and big end for your PC, as with Micro USB. A third benefit of Type-C is that it can deliver greater amounts of power—up to 100 watts. That means you should be able to charge something as big as a laptop via a USB cable, as well as the phones and other small devices you can charge today. Jeff Ravencraft, president and COO of the USB Implementers Forum, pointed out to us that that was first-generation silicon being used and that the SSD drives were at capacity. He’s confident he’ll soon get to throughput of well over 1GBps. Nokia’s N1 tablet is among the first products that have been announced with a Type-C connector port. Nokia has said it will go on sale in February in China and soon after in other countries.